Find artworks, auction results, sale prices and pictures of Christian I Sell at auctions worldwide. 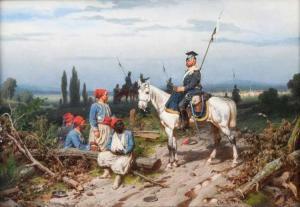 Christian Sell the Elder Hamburg 1831 - Düsseldorf 1883 A Prussian Uhlan guarding French Zouaves Oil/wood, 33 x 46 cm, lo. ri. sign. a. dat. Chr. Sell 1876, framed under glass. German battle painter. S. studied at the Düsseldorf academy under Th. Hildebrandt a. W. Schadow. As a war artist he accompanied the wars of 1864, 1866 a. 1870/71. His son of the same name was a battle painter too. Christian Sell the Elder Hamburg 1831 - Düsseldorf 1883 A Prussian Uhlan guarding French Zouaves, Oil/wood, 33 x 46 cm, lo. ri. sign. a. dat. Chr. 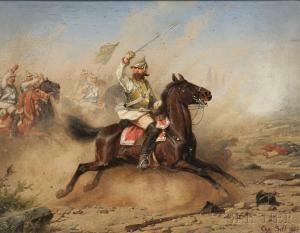 Sell 1876, framed under glass., German battle painter. S. studied at the Düsseldorf academy under Th. Hildebrandt a. W. Schadow. As a war artist he accompanied the wars of 1864, 1866 a. 1870/71. His son of the same name was a battle painter too. Links unten signiert und datiert „1875\“. Das kleine Gemälde gehört sicher zu den Meisterwerken des Künstlers der speziell für die Wiedergabe der Kriegseignisse dieser Zeit berühmt wurde. Auktion H.C. Chapman & Son, 19. Oktober 1993. Signed and dated \“1875\” lower left. Auction H.C. Chapman & Son, 19th October 1993. Antiques Trade Gazette, 6, November 1993, p. 44, the relevant excerpt is affixed to the reverse of the panel. Oil on panel, 8 x 10 1/2 in. (20.3 x 26.7 cm), both framed. Condition: Minor paint losses, surface grime. Provenance: Doll & Richards, Boston; by family descent to the present owner. 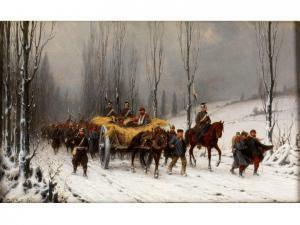 This oil painting is a signed work by the German painter Christian I Sell (1831-1883). 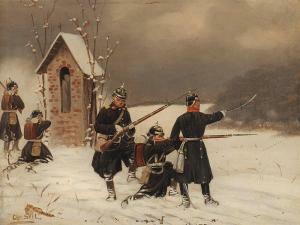 It shows a snow-covered landscape that is characteristic of the artist with a small wayside chapel and five Prussian infantrymen with bayonet rifles and sabres. The painting shows some colour flakes as well as framing marks around the edges; the frame displays traces of age and wear with few cracks. The painting is signed lower left, 'Chr. Sell'. The dimensions are 32 x 38.5 cm (framed) and 18.3 x 24 cm (stretcher frame). Christian Sell (1831-1883) Born in Hamburg Altona, the painter Christian Sell studied at the Dusseldorf Academy from 1851 to 1856 and undertook numerous study trips through Germany and Belgium. In his early works, he created historical war scenes from the 17th century. However, due to his participation in the wars of 1864, 1866 and 1870, he went over to the description of contemporary events. Works by Christian Sell are displayed in important collections, for example at the Military History Museum in Vienna, and the Berlin National Gallery.